Football news: McCarthy excited by Man Utd rumours. McCarthy excited by Man Utd rumours. McCarthy flattered by United interest. 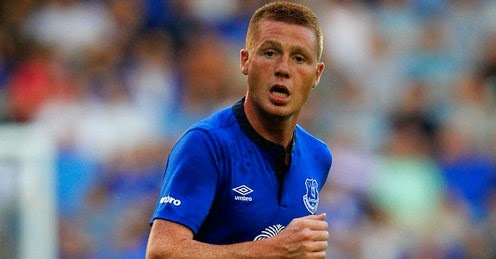 Everton midfielder James McCarthy is excited by recent rumours linking him with Manchester United. The Ireland international enjoyed a fantastic campaign for his Premier League side Everton after joining from relegated Wigan Athletic last season. "If a club like Manchester United are interested, obviously you are doing a good job. "We will see what happens". Clubs reported to also be in the race to sign the talented midfielder are Tottenham and Arsenal fc. "Tottenham didn't come up with the money but Everton did within the last couple of hours. Obviously it was just one of those things with Tottenham", the highly sort-for Everton midfielder said. McCarthy also indicated that he was happy with the performance of Everton last season. "You would like to get into the Champions League but, thankfully, we've got the Europa league. "People say the Europa League is not such a big thing but it was a massive achievement for everyone at the club", he added. "Obviously we are not different from any other club.Our main aim is to get into the Champions League.We want to improve on last season and push even further". McCarthy played 31 league games, three as a substitute and he scored a goal.